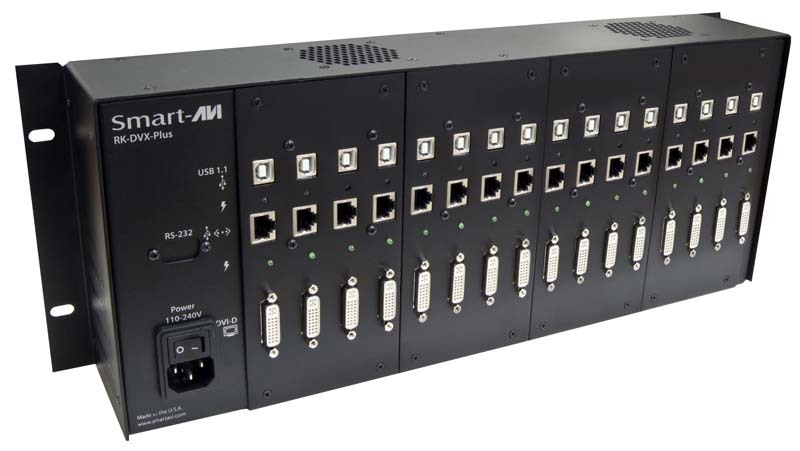 SmartAVI's RK-DVX-Plus is a 16-port, rack-mounted DVI-D & USB signal extender with an active range of up to 275 feet via shielded twisted-pair CAT5/6 cables. Powerful Multi-Device Extension The RK-DVX-Plus extends 1080p (1920x1080 @ 60Hz) Full HD video signals from up 16 DVI-D sources and USB signals from 16 USB sources to end-point devices up to 275 feet away. 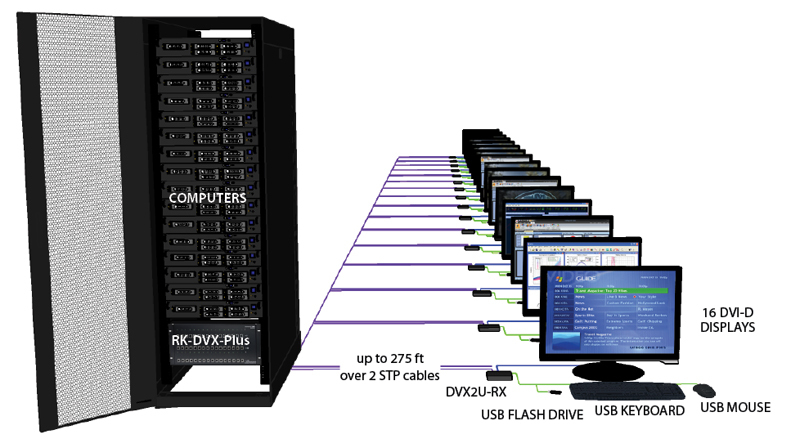 Excellent for KVM ('Keyboard-Video-Mouse') extension, the DVI-D/USB combination makes the RK-DVX-Plus an outstanding command tool for remotely operating multiple computers from a central hub. 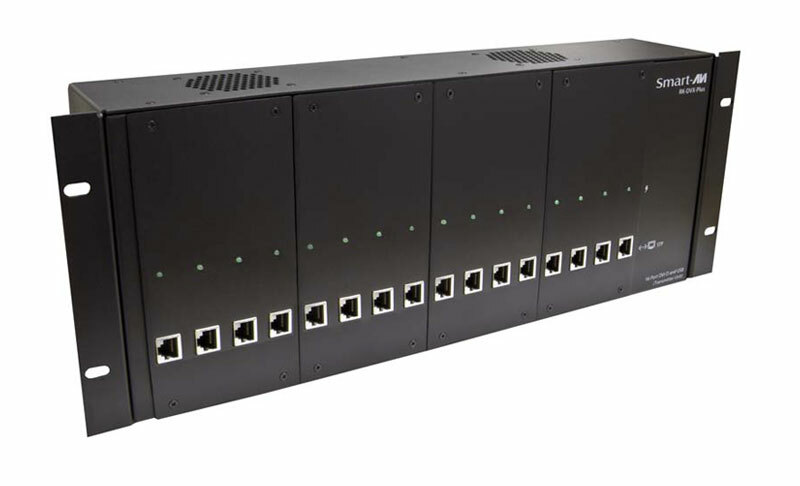 Better yet, the RK-DVX-Plus is plug-and-play ready, easy to install into rack-mounts and even easier to start using, as it is designed for users of any technical proficiency. Affordable Extension For Any Environment or Application The RK-DVX-Plus excels in all kinds of AV-centric environments, including entertainment venues, airports, office buildings, and event halls. It is also cost-efficient, using inexpensive and reliable CAT5/6 STP cables to boost signal ranges without risk of interference or degradation. Presentations DVX Plus enhances any presentation from commercial products to corporate financial data. It can be used in show rooms, board rooms, trade shows and window displays. Data Broadcasting Data such as news, stock prices, sports results, and flight information can be broadcast in real time to various monitors and/or speakers. Learning and Training RK-DVX-PLUS can be used in educational presentations, in schools and in other training facilities. 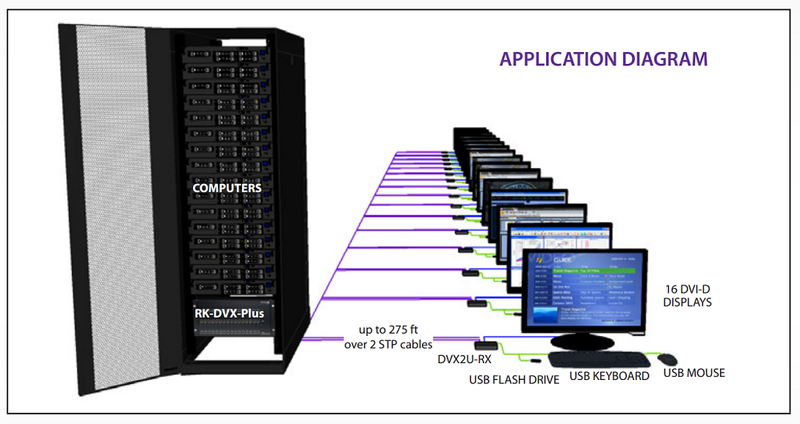 Additional Applications RK-DVX Plus can also be used in the following applications; Security, PC Networking, Conference Center Systems, Point of Sale, Camera Surveillance, Control Room Systems, and many more.